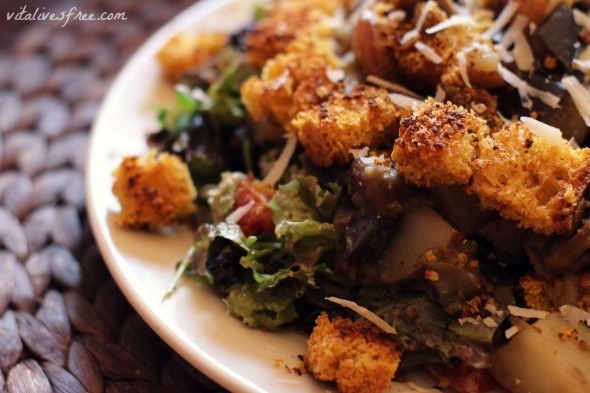 Eggplant, Potato, and Mushroom Salad Recipe – Umami At Its Best! Balanced, bursting with flavours, pure umami, satisfying, decadent, surprisingly easy… This eggplant, potato, and mushroom salad is all of that and more. The other day I posted a photo of a very special salad on my Instagram account (if you aren’t following me there already, you should!) and a few of you wanted to know the recipe. So here I am writing it up! This recipe was originally meant to go up a couple of days ago, but sticking to deadlines while living without electricity is impossible. Should have learned that ages ago. Under-promise, over-deliver… That should become my mantra because no matter how much I’d like to do things on my blog or YouTube channel, things aren’t as easy. By the way, if you’re wondering what’s going on with our electricity situation, there is no news. Still! Can you believe that? It’s been more than 6 months now. It all seems surreal and I can only wonder how much longer they will keep us waiting (by “they” I mean the monopolistic electricity supplier). There are so many things I’d like to do and I can’t. On a more positive note, our dog Giulietta has finally got over her separation anxiety and now can safely and comfortably be left at home. Phewwwww! I’ve been waiting for this moment for months. It means that I can finally go to work at the local library. But once something gets sorted, something else usually go wrong, right? Yup, now my WordPress dashboard refuses to work in the library most days. It does occasionally work in the mornings, but it’s never certain. I could go to the Internet cafe but I can’t make myself to. I feel awful every time I go there. Being surrounded by hundreds of machines and their electrical fields definitely doesn’t sound appealing to me. I hope you, guys, will understand and won’t abandon me. I’m really doing my best, and it’s still better to do things later than never, right? Alright, let’s move on to the recipe. The other day, I had some mushrooms and eggplant that had to be used up. I also had a ton of potatoes, so that’s how I came up with this awesome eggplant, potato, and mushroom salad recipe. It took no time to put together and it was delicious. My hubby was impressed beyond words! Whenever I make salads, I like combining raw and cooked ingredients, I like it cold and warm at the same time. I find this kind of salads balance my body perfectly. If it’s hot, I add a bit more cold, raw ingredients. If it’s cold or rainy, I indulge in more cooked things. My way of eating is all about gentle balancing and constant adjusting to my body’s needs, weather, season or my moods. There is nothing constant about diet. Just like there is nothing constant about this world, our lives or bodies. Balancing is key. Now that I got my food philosophy out of the way, let’s get to the ingredients. This salad recipe is vegetarian, but you can make it vegan if you omit the cheese and swap the yogurt dressing for a vegan alternative, such as olive oil and vinegar, lemon juice with oil or alone, or a gentle vinaigrette. This salad recipe can also become gluten-free if you avoid using bread. You can swap it for some toasted seeds, such as sunflower seeds and/or pumpkin seeds. Eggplant, Potato, and Mushroom Salad – Super Filling and Vegetarian! A balanced, easy, and healthy recipe that will push all the buttons for you. Umami taste at its best. Chop all the lettuce, arugula, and tomatoes. Place in a bowl. Add avocado and yogurt, mix well. Divide the mixture onto two different plates. Set aside. Chop aubergine and potatoes (unpeeled) into bite size pieces. Slice mushrooms. Heat some oil in a pan. Peel the clove of garlic, chop it in half and stick a fork into one of them. Rub the garlic clove all around the pan to infuse the oil with garlicky taste. It will make the vegetables taste delicious! Add aubergines, potatoes, and mushrooms to the oil and cook until they soften, around 10-15 minutes. Once they are ready, place them on top of the lettuce on the two plates. 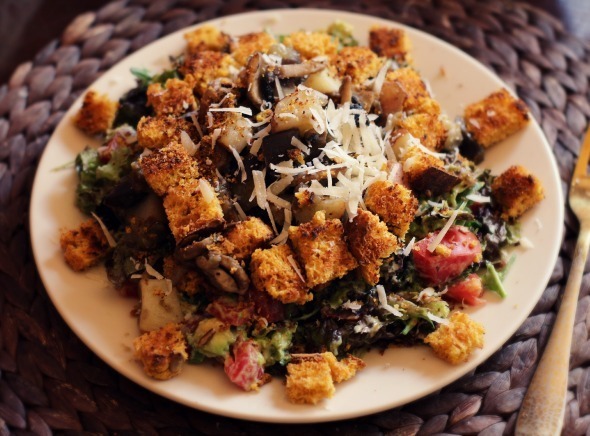 Toast the slices of bread, chop them into crouton-size pieces, and scatter them on top of the salad. Finish by shaving some Parmesan on top. That’s it! This salad is super nutritious and healthy. It’s also a little deviation from the regular all-raw salads. It’s going to be a regular staple on my dining table from now. I hope you’ll enjoy this salad recipe as much as us two and if you know someone else who would like it, please help this blog grow by sharing this recipe with them. Eating healthy doesn’t have to be time-consuming, bland, or boring. Let’s help each other fall in love with food all over again! Hi Vita, I have been following you on utube for about 6 months or so and have really enjoyed your posts. I began the paleo diet about 7 months ago and that is what led me to your Chanel. I was not what you would call a strict paleo girl but I did persevere. I lost weight and am down 15 kg, which is great. I have however not had the energy, clarity or feelings of excellent health that many paleo people rave about, and this brings me to the reason for this letter. I have to say thank you for your recent post outlining the reasons why you gave up the strict paleo diet. I could identify with many of the symptoms you wrote about. This week I have started to introduce bread and rice back into my diet and I must say I have suffered no ill affects. My mind is bothering me however, and I am concerned that I will put the weight back on. Would you be able to tell what you are eating on a regular basis that is both nourishing and has kept you weight in check. Hope this is email finds you well and happy looking forward to reading and watching your upcoming downloads . Kind regards Margaret.